A.R.E. 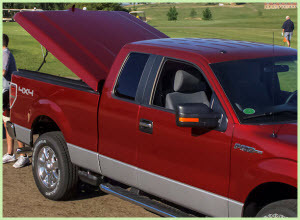 LSX Model Fiberglass Tonneau Cover is a popular choice among pickup truck owners. Oh, my, my! There are more Tonneau Cover Manufacturers than Carter has liver pills. No wonder people get confused when they go out to buy one of these things! Let’s simplify the job - here are some of the most popular manufacturers in North America along with a quick description of their product line. For more detailed company and product line info just click on the company name link. You'll also find a direct link to the manufacturer on each of these pages. The manufacturers website is a great place to start if you want info on accessories, parts, dealer locations, user guides, installation videos and usage tips. In addition, the Miscellaneous Tonneau Cover Manufacturers page contains a list of some interesting tonneau cover manufacturers for which we have insufficient information to justify the creation a an entire page. Mud, water and other slushy gunky stuff commonly overflows your truck floor mats and gets trapped between your mats and the carpeting. Now you have mold and mildew with the resultant smells and other problems. Same thing goes for your truck bed if your have it carpeted. Moisture and mud sometimes penetrate the seal around your tonneau cover and wet the carpet. Moisture doesn't evaporate easily from inside the truck bed unless you intentionally leave the tonno open and air out the bed. Here comes the mold and mildew again. Universal absorbent car/truck floor mat protectors can help keep your floors and carpeting dry, reducing mold, mildew and dirt transfer to your shoes. This type of mat is easy to clean, so it'll also save you cleaning time and effort.